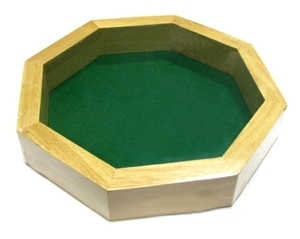 This 10" finely crafted tray is made from smooth blonde wood with a green felt rolling surface. The octagonal dice tray is an excellent place to roll your dice. The tray is about 1.5" deep on the inside, and will help contain bouncy die rolls!